Ever heard of the Garmin Striker 4 with Portable Kit? This fish finder is known to a lot of anglers due to its affordability and great functionality. It includes a lot of features that make fishing a great and fruitful experience. More to that, it is portable to enable you to go with it anywhere. With this device, no need to drill your boat to mount it meaning that it offers you with a lot of conveniences. Most customers do not even forget to mention about how effective it is. With it, you will not miss out on your catch since you will know where the fish lie, and not only that, you can manage to locate the same spot time and another. Even better since it is budget friendly, you do not have to break the bank to get it. Keep reading the Garmin striker 4 portable review covered below, and be sure to determine if it is the best fish finder for you. 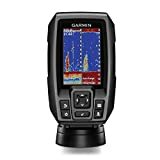 In our Garmin striker 4 portable review, the first feature about this fish finder is that it does not include the traditional 77/220 kHz transducers, but a Garmin CHIRP 77/200 kHz. As such, you can be sure to benefit from a higher visibility and clarity level. What’s more is that Gaming striker 4 features a Chirp sonar technology that can generate crisper fish arches with a greater target separation.The reason behind this is that it sends more than a single frequency ranging from high to low and then interprets them individually. With this fish finder, you can upgrade to a high-performance Garmin CHIRP with a GT8 or GT15 transducer so that you can benefit from crystal clear sonar images with a more remarkable target separation and resolution. From our Garmin striker 4 portable review you realize that another plus of this fish finder is the built-in high-sensitivity mapping GPS. This feature allows you to locate your current position fast and accurately. Even better, it gives you the ability to mark the points where a lot of fish are so that you can return to them in your future angling experiences. Whats more is that you can mark the boat ramps, docks, and other locations on the lake so that you can use the waypoint mark to view and navigate such positions when you wish. With this fish finder, you can also share the waypoints you create with other strikers. What would be better than a fish finder that will let you track the speed at which you are trolling? The speed at which you are rolling your kayak or boat has a significant effect on the effectiveness of the lure you are using as well as the fish species you are trying to attract. The gamer striker 4 fish finder will let you track your speed so that you can maintain the right speed for the best experience. It allows you to do that easily by checking your boat’s speed on the screen. Apart from letting you find fish, the Garmin Striker 4 with Portable Kit will let you see the bottom while ice fishing or jigging so that you can know if it is solid or muddy. Whats more is that you can see how high your jig is being lifted and whether the fish are moving toward or away from the jig. By such a measure, you can get to find out if your fishing experience will be a success or fail. Another inclusion in our Garmin striker 4 portable review, is a portable kit that is included in this fish finder to let you take it anywhere. 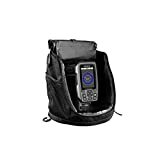 You can place your fish finder in the compact bag that comes along with it so that you can move with it easily. The kit also includes a rechargeable battery with charger, a suction cup transducer, tilt or swivel mount, and built-in transducer cable management. Question: Does the unit display water temperature? Question: Is this unit suitable for ice fishing? Question: Does the Garmin Striker 4 with Portable Kit feature a transducer for boat and ice? Question: How can I mount the transducer for trolling functions? The Garmin striker 4 portable review gives you more than enough reasons as to why you should give this fish finder a try. It includes the essential features to enable you to have a successful fishing experience and not only that, but all these are given to you at a very reasonable price. Be sure to try out this fish finder and be sure to get the best experience just like most anglers who have given it a try in the past.